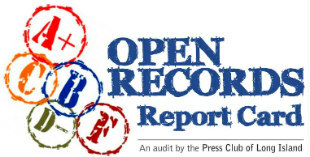 An unprecedented audit by the Press Club of Long Island on the responsiveness of 196 municipalities and agencies to New York State Freedom of Information Law requirements revealed almost two-thirds failed to respond to requests for public records before the deadlines set by the law while almost half did not provide a list of documents they’re required to maintain. The overall average grade that Long Island local governments and agencies received for FOIL compliance is a C. That was calculated by averaging the grades of all 195 municipalities and agencies. Nassau County agencies scored an average of D+. Suffolk agencies got a C+. The 13 towns and two cities averaged a B grade. And the average grade for the 97 villages was C.
64% of the governments or agencies (125) failed to respond to PCLI’s requests by the legally required deadlines. 46% of the governments or agencies (90) failed to provide a list of documents they’re required to maintain. 32% of villages (31) did not provide copies of their FOIL policies, which we later found in their codes. Only 44% of the governments or agencies (86) had directions on their websites explaining how to request records. This is not required by FOIL, but it is a measure of how easy or hard local officials make it for the public to obtain public information. 16% of the governments or agencies (32) scored failing grades in PCLI’s rating system. 24% of the governments or agencies (47) failed to maintain their own FOIL policies as required by law. Local governments are required to have a written FOIL policy that stipulates who the freedom of information officer is, what hours a person making a FOIL request can pick up files, to whom appeals of record request denials should be made, and other information. 16% of all agencies (32) forced PCLI to appeal a denial of requests for records that the FOIL stipulates are public information. 15% of all governments or agencies (29) charged for photocopying documents that PCLI wanted emailed. Agencies are required to email documents requested that way as long as they are able to do it. 3% of all governments or agencies (6) failed to provide their payroll listing as required by law. Lindenhurst was the only village unable to provide minutes of its latest board meetings. The Village of Sands Point was the only government or agency on Long Island that violated rules against charging exorbitant amounts for documents. It charged PCLI $150 to email a copy of its payroll list. FOIL established the four-decade-old process that the public, media and others use to obtain government documents. Released today for national Sunshine Week, the audit of local government compliance was conducted over 16 months by Timothy Bolger, freedom of information chair for PCLI, the local chapter of the Society of Professional Journalists. It is the biggest project in the history of PCLI, which was founded in 1974. SPJ, the largest national journalism organization, advises reporters not to tell the subjects of an audit they are being audited so as to not taint the results. This recommendation was followed for the PCLI audit. Bolger identified himself as a member of the press and his requests were mostly made via email except in the cases of agencies for which no email address could be found. In those cases, he mailed requests. PCLI spent $892.72 requesting documents from 84 Nassau and Suffolk county agencies, 13 towns, two cities and 96 villages beginning in October 2015. The biggest bill came from the Town of Islip, which charged $221 because minutes of its town board meetings were only available in the form of transcripts. Only 29 agencies—15 percent of those audited—billed us. Most complied with our request to email us electronic copies of the documents or didn’t charge for paper copies. PCLI stopped short of taking nonresponsive agencies to court to ask a judge to compel them to release public documents, which is the next step under FOIL when an appeal of a records request denial is denied. Under the law, a judge can award attorneys’ fees in such cases to the plaintiffs, should the case be decided in their favor. Judges sometimes order non-compliant agency staffers to take FOIL refresher courses led by the state Committee on Open Government, which also regularly publishes advisory opinions on FOIL issues brought to its attention. At the conclusion of the audit process, Bolger requested comments from all of the local governments and agencies that were queried. Comments from those who responded are included in this report. The report card mostly graded the local governments and agencies on the following requirements specified in FOIL: whether they responded to records requests within deadlines; if they provided documents they are required to maintain; if they denied requests in writing; if they identified their FOIL denial appeals officer; if we had to appeal a denial; and if they emailed the documents when requested. They were also graded on two other criteria not specified in FOIL: how many times we had to follow up, and their helpfulness, such as turning over documents well ahead of deadlines, or unhelpfulness, such as requiring us to go to their offices to pick up files in person. Using a system that considered D- as passing and the highest grade possible as A+, we graded municipalities’ responsiveness on a 10-point scale while county agencies were graded on a 9-point scale, with half points possible. The reason for the different scales was that one of the documents governments are required to maintain and provide upon request are minutes of legislative meetings. Because the Nassau and Suffolk legislatures each have archives of their minutes and recordings of their meetings online, we didn’t make those requests of them. But we did request the agendas and minutes of the five most recent board meetings for the towns, villages and cities. County agencies were not asked to provide minutes because most don’t hold public meetings. Only the Village of Lindenhurst failed to provide its minutes. Six governments or agencies failed to provide a payroll list detailing the names, titles and salaries of current employees—one of the documents that all governments and agencies are required to maintain and provide upon request under FOIL. Another document we requested from all governments and agencies that they’re required to maintain was copies of FOIL-mandated policies detailing how they respond to records requests. We also requested copies of subject matter listings, a lesser-known document that agencies are required to maintain. The document is essentially a list of the types of records that agencies keep on file. Ninety-one failed to provide one or the legally accepted alternative: stating that the government or agency follows the state’s Records Retention and Disposition Schedule, which the Committee on Open Government recommends municipalities formally adopt. All governments and agencies were asked to provide copies of the log of their records requests and their log of subpoenas—documents they aren’t required by law to maintain. If those requests were not approved—whether because the files don’t exist or another reason—no points were deducted in the report card. But if they provided these non-required documents, they got a point in the helpfulness category. The lowest grade given was zero, shared by the Suffolk County Office of Minority Affairs and the Village of Island Park. The minority affairs office did not respond to our requests and no payroll list was provided for it by the county. Island Park stood out as the only village on Long Island that did not respond to any of our attempts–eight in this case–to request its records until we asked for a comment on its failing grade. Municipalities and agencies that scored an A+ were Nassau Community College and in Suffolk County government, the Clerk of the Legislature, County Clerk, Fire and Rescue Services, and the departments of Public Works, Social Services and Information Technology. Also earning A+ grades were the towns of Huntington, Riverhead, Southampton and Southold and the villages of Lattingtown and Lynbrook. The quickest responses came from the villages of Sagaponack and Amityville, which provided responses on the same day we filed requests. The agency that took the longest to complete its response was the Suffolk County Fire Department of Health Services—382 days. “The Freedom of Information Law is a central component of public integrity and disclosure,” Gov. Andrew Cuomo said during his 2016 State of the State address while chiding the scandal-scarred State Legislature to stop exempting itself from FOIL.